If you're on the hunt for a casual yet totally chic ensemble, consider pairing a black coat with black leather skinny jeans. Both garments are totally comfy and will look fabulous paired together. Finish off with white leather pumps and off you go looking stunning. If you're searching for a casual yet stylish ensemble, dress in a Halogen asymmetrical zip wool blend coat and black skinny jeans. Both garments are totally comfy and will look fabulous paired together. Brown leather chelsea boots will add more playfulness to your outfit. If you're in search of a casual yet totally stylish look, pair a Halogen asymmetrical zip wool blend coat with black skinny jeans. Both garments are totally comfy and will look fabulous together. For something more on the daring side to complement this getup, go for a pair of black studded leather lace-up flat boots. This pairing of a Halogen asymmetrical zip wool blend coat and a pink midi dress is effortless, totally stylish and oh-so-easy to imitate! Break up your look with more casual footwear, such as this pair of black leather cowboy boots. If you're on the lookout for a casual yet totally chic outfit, consider pairing a Halogen asymmetrical zip wool blend coat from Nordstrom with black ripped skinny jeans. Both garments are totally comfy and will look fabulous together. If you're on the hunt for a casual yet absolutely chic look, pair a Halogen asymmetrical zip wool blend coat with blue jeans. Both garments are totally comfy and will look fabulous paired together. Look at how well this ensemble is rounded off with black leather pumps. If you're on the hunt for a casual yet chic ensemble, opt for a Halogen asymmetrical zip wool blend coat from Nordstrom and black pajama pants. Both pieces are totally comfy and will look fabulous paired together. Go for a pair of white leather low top sneakers to make the getup more current. 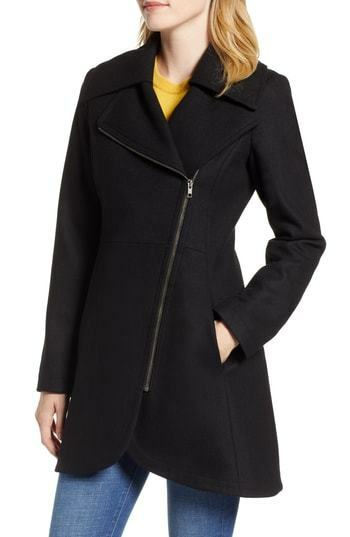 For a casual chic look, marry a Halogen asymmetrical zip wool blend coat from Nordstrom with black leather skinny pants — these items play nicely together. Black cutout leather ankle boots work spectacularly well here. For a knockout-meets-totally chic outfit, team a Halogen asymmetrical zip wool blend coat from Nordstrom with white skinny pants — these two pieces go nicely together. 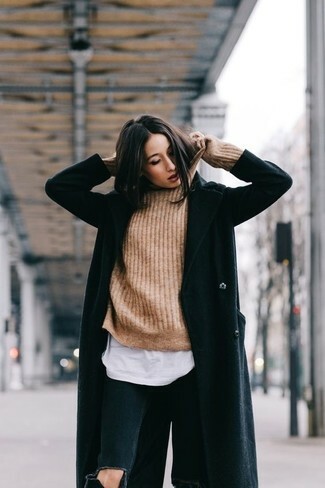 When it comes to footwear, this look is complemented nicely with brown leopard suede pumps.